Having recently moved into Casey’s grandmother’s dilapidated old farm in Northampton, Massachusetts, the Turtles, April and Casey find that getting the joint back into livable condition may be an impossible feat. Meanwhile, at a dive in nearby Holyoke, Casey’s cousin Sid is rounding up his gang of thugs and miscreants. He’s heard that his “psycho” cousin has moved into the old homestead, which is convenient, as Casey has something Sid desperately wants. Back at the farm, Don is looking through a box of toys in the attic when Mike scares the bejeezus out of him by pouncing on him while wearing a raccoon skin coat. Playtime’s at a end, though, as Sid and his gang pull up the driveway. Pulling a gun out of the glove compartment, Sid says he plans on “scaring” Casey a little. Seeing his cousin Sid approaching from a window, Casey tells the Turtles to hide. Not on great terms with his cousin, Casey refuses to let him in. Sid has other plans, and his goons Max and Spuds grab Casey and drag him into the house. April stands by and watches as Sid pulls out his gun and demands Casey tell him where their late grandfather hid his share of the Hoosic Tunnel train job loot. Casey doesn’t have a clue, but Sid won’t believe him. Upstairs, the Turtles overhear the commotion and decide to sneak out the window and draw away Sid’s flunkies. Sid hears someone outside honking the horn of his car and dispatches his four buddies to deal with them. Hiding in a snow bank, Leo waits for one to pass, then clocks him with the handle of his katana. As one goon is checking the firewood locker, Raph leaps down behind him and karate chops the idiot in the back of the neck. And inside the barn, Mikey ambushes a goon while wearing the raccoon skin coat, quickly pummeling the thug into submission. 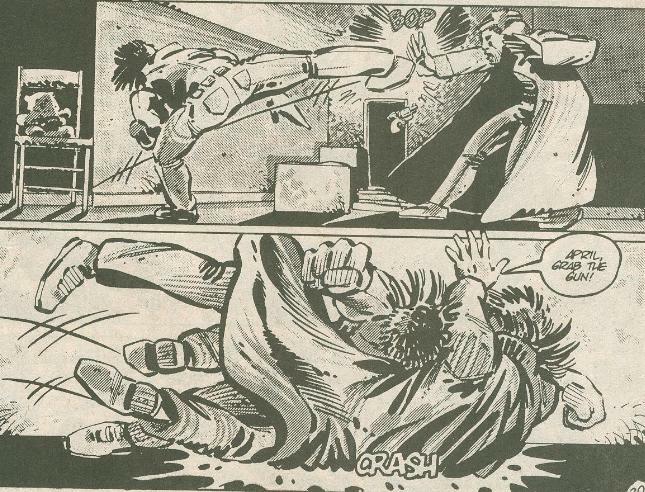 Lastly, Don sneaks up on the final thug and takes him down with a quick judo-flip. Back inside the house, Sid and Casey are arguing. Suddenly, Sid hears his car horn honking again and his momentary distraction is all Casey needs. Tackling Sid and knocking the gun from his hand, Casey begins pummeling the jerk as April recovers the firearm. April begs Casey to stop before he goes too far and Casey concedes to let his cousin off the hook. Sid, however, has gone completely nuts with desperation for the $250,000 payday, repeating their grandfather’s last words over and over: “X marks the spot”. The words ring a bell with Casey, who dashes outside. Walking around the cobblestone foundation of the house, Casey recounts how he and his grandfather once adopted a stray dog named Spot. When Spot died, they buried him out back near a rock in the foundation they thought looked like a headstone. Casey finds the rock and begins pulling out the smaller stones around it. Eventually, he finds a small lock box, which Sid immediately tries to swipe from him. The two tussle, breaking open the box and sending papers flying. But it isn’t money; it’s a pile of receipts for charitable donations. Apparently, Casey’s grandmother donated the $250,000 to try and make up for her husband’s crimes. April and Casey look proud, though Sid collapses into a sobbing mess. Epilogue: In the house, April and Casey are confident that Sid will never bother them again now that there’s no money to be had. One of the Turtles wonders if Sid has found his unconscious buddies in the trunk of his car, yet. Another Turtle, holding up the key, says he doubts it. *This story takes place during TMNT (Vol. 1) #11. *Casey will wax on about his childhood with Sid in TMNT (Vol. 1) #14. *Sid will return years later in Tales of the TMNT (Vol. 2) #43. *As a preview for the upcoming Tales of the TMNT ongoing series, a bonus short, “The Survival Game”, was published in the second printing of TMNT (Vol. 1) #4 and given the “Tales” branding. *This issue was adapted by the 4Kids TMNT animated series into the episode “Cousin Sid”. *This issue also featured a bonus pin-up of the Turtles and the Shredder by Dan Berger; one of Bergr's earliest TMNT contributions. *CHET ALERT: On page 5, there’s a beer called “Chet’s Special Export”. 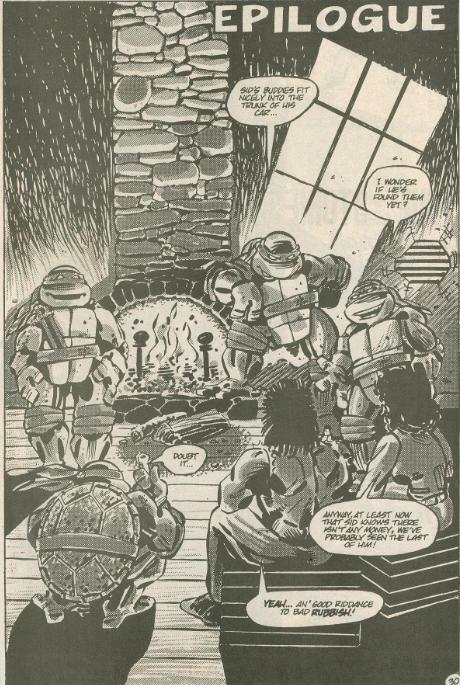 The name “Chet” was an in-joke snuck into several issues of the Mirage TMNT comic because the guys… just liked the name! 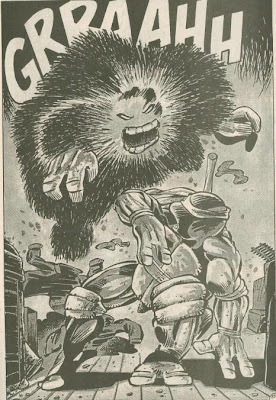 And the most prolific artist in TMNT history makes his debut: Jim Lawson. 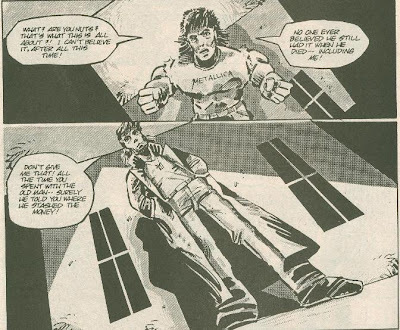 The Jim Lawson of the first volume of Tales of the TMNT and the “Return to New York” story arc is almost unrecognizable as the same Jim Lawson from “City at War” and onward; certainly nothing like the Jim Lawson we’re used to today. Lawson’s early style, perhaps a bit unrefined (he seems to have trouble with foreshortening), took greater pains in detailing characters’ faces and expressions and, for goodness sake, there's such a thing as rounded-off edges. Were you to compare Tales of the TMNT (Vol. 1) #1 with just about any story he’s drawn in the last ten years, at a glance you’d never think they were the same guy. 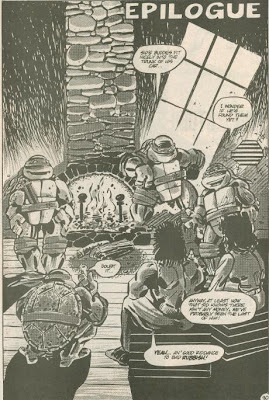 I think that this first volume of Tales of the TMNT looks better and better as you go along, particularly once you get nearer the end of the volume, where more instantly recognizable “Lawsonisms” present themselves but without the grotesque geometric reduction that plagues his modern work. Ryan Brown’s inks and duotones do a great job in complementing Lawson’s pencils, too, which gives a very distinctive and exciting look to this series and their synergy would only improve with each passing issue. Storywise, this is sort of the “forgotten” Tales Vol. 1 issue for me, as whenever I recollect the series my memory tends to omit this installment. 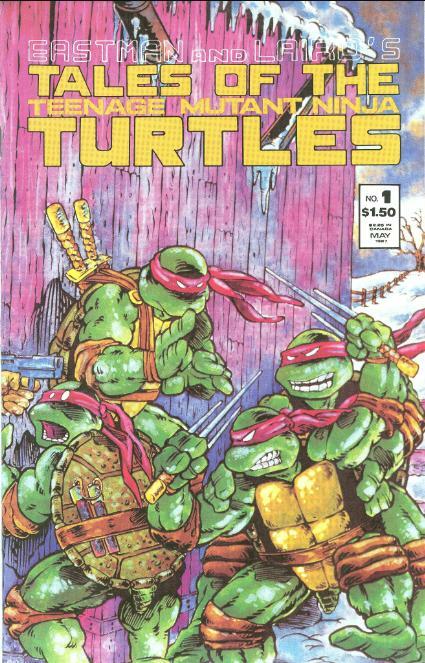 When the succeeding issues feature the introductions of major characters like Nobody, Leatherhead or the Rat King, or the return of classic characters like Savanti Romero or Complete Carnage and Radical, or even exciting battles with a giant demon statue… the issue where the Turtles beat up some stupid thugs and find a box of receipts tends to fall by the wayside. The story isn’t bad, just kind of uneventful and dull. 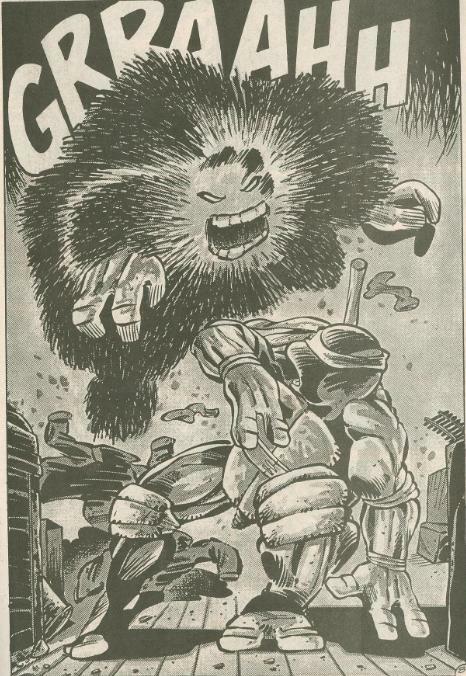 The goons aren’t even a remote challenge for the TMNT and the only suspense comes in Casey facing down his cousin, and even then, he takes the danger in stride. It’s a nice character piece for Casey, particularly the way it shows how his relatives perceive him (the family “psycho”), but the whole thing is just kind of forgettable. Also, where the heck is Splinter? The first volume of Tales of the TMNT is one of the best runs of the Mirage series, basically hitting one milestone story after another. This first issue, however, is very low key and pales in comparison to the other six installments. Check out Lawson's Bade Biker and Orson series for more extensive looks at his early style circa 1986, one which I have come to appreciate. It's visually distinctive in its own right, so I have no idea why Lawson felt like he needed to evolve it into a completely different animal. Huh, having not read this issue, I had no idea "Cousin Sid"'s Spuds was actually a character from the original story. Kinda obvious, in retrospect--it is a very "Mirage" name, quite different from the sort the cartoon usually used for its one-shot characters. In any case, now that we recently got a look at the Lloyd Goldfine/Peter Laird correspondence regarding this adaptation, we know that your observation--that Sid and the gang presented no threat to the turtles--was one of the obstacles 4Kids felt they had to tackle before they felt they were able to tell this story. What do you think about their solution? Do you feel it helped improve the story? And which take on the character of Sid do you prefer? Does the comic read "X marks the spot"? I remember the episode changes it to "Spot marks the X" in an attempt to make it more cryptic. Yeah, the comic reads "X marks the spot" and the cartoon changed it. Again, kinda for the better, I think.